Something is finally happening at the former KULCHA on the Fremantle Cappuccino Strip. I noticed the banner for the BEERPOURIUM (silly name!) and checked them out on Facebook. It is going to be a small bar specialising in craft beer with woodfired food on offer, so a bit different from the application with the City that promised a restaurant and music venue. There is no opening date yet, but it says it will be the summer of 2019, so that should be soon. They only received their liquor license for a small bar recently. Good luck and may it become a lovely relaxing venue to have a quiet beer with friends! Fremantle Litte Creatures upstairs bar Next Door is no longer but will re-open as HELM mid this month, so go and have a look. Little Critters is also celebrating their 18th anniversary this month, so check out the Facebook page for special events. 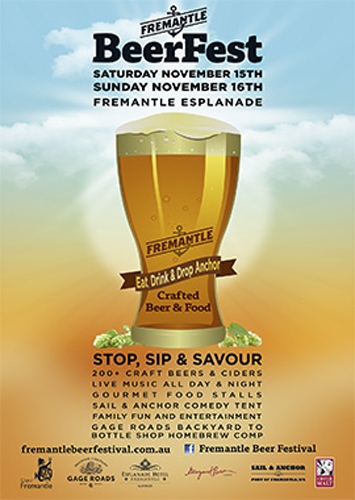 It’s going to be a really lovely Fremantle weekend with temperatures in the mid twenties, so why not head down to the FREMANTLE BEER FESTIVAL on the Esplanade. Tickets are $ 25 for a day ticket or $ 35 for a weekend one. These are some of the brewing companies you can try great beers from: Two Birds, Moody Cow, Nail, Northbridge Brewing, Margaret River Ale Company, Little Creatures, Cheeky Monkey, The Old Brewery, Sail&Anchor, Monk, Feral, Gage Roads, Matso’s, Homestead, Billabong Brewing, Cape Bouvard, Iron Bark, Old Coast Road. There are others and also cider producers as well as live entertainment and food stalls.